Well it's Thanksgiving in America, Friday Eve over here and time for another CASE study! Now I'm gonna surprise y'all and produce a Christmas Card before your very eyes *gasp* I know, you're seeing them everywhere at the moment, but for me this is major. I'm awful at making Christmas cards - I hardly find the mojo or the time for it all *sigh*! Seeing as I used that ol' snowflake die - I'm hoping that this card will qualify for Lucy's challenge too! Now I know that some of you are real busy at this time of year (especially with Thanksgiving!) but we'd love it if you could squeeze in any inky time to play along with us! Why not check out what the rest of the super-talented CASE study DT rustled up? And for one lucky, random participant there's a $25 gift certificate to Artful Delight up for grabs! Right, I'm off to find my de-icer and ice scraper now as they're predicting ice and snow for now and the weekend...eek! Love your Christmas card Aimes, so elegant and soft. Wow Aimes! If this card is you being "awful at making Christmas cards" I wish I was equally so! Beautiful. Oh yes I do see the shimmer, it looks wonderful! It's such an elegant and subtle card for holdays, so different from the usual bright reds & greens... and I love it!! Aimes, this is so soft and subtle and stunning at the same time. Love the flourish...one of my all time favorite stamps! Stay warm with the cold weather coming!! Love that lilac and ice blue together. Very wintery and in keeping with the weather here too! oooh....such a pretty take from the inspiration.....happy thursday!!! Your card does not indicate to me that you have ANY trouble with Christmas cards! I love all the shimmer and soft, subtle colors that you used. Just an all around beautiful card my dear! Oooh, love the soft colors, the swirls, and the shimmer! Gorgeous, Aimes! Oh, now that is sooo classy Aimes. It screams out elegance and I love your strategically placed gems! Gorgeous. If the rest of your Xmas cards are like this, you have no probs! So beautiful and elegant! Love the shimmer, I can see it! Awful at making Christmas cards??!! Oh, puh-lease!! This is heavenly. You are so wonderfully talented, Aimes. Swoon! Soft, shimmery, swirly superbness! Aimes,stay warm and safe this weekend. Oh, the soft colors and glimmer make it such an elegant card! Love that big snowflake on here - I kinda forgot I even have that in my stash as well. Awful at making christmas card- hardly!! I love the subtle colours, the flourish is a magical touch, may need to case this one myselt-lol!! Love the soft colors together especially that lilac color! I recently bought some shimmer cardstock too and LOVE it! WOW: This Christmas card is beautiful Aimes, love the soft colours and layout :) Hope you and your family are doing well and you're getting a little organised for Christmas! Aimes, this is sooooo pretty. I love the soft colours and the flourish is just gorgeous. OH so pretty! That shimmer paper is too cool! Love it! So pretty Aimes!!!! 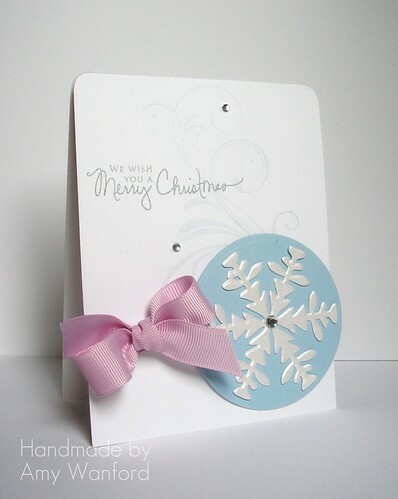 Love that shimmery cardstock - makes a perfect snowflake! What beautiful, soft colors too! Love this, so soft and pretty. Love that big giant snowflake! Very soft and pretty. Love the lavender and blue together too. Yay for shimmer! :) Loving that snowflake die! A Very Happy (and bright) Birthday!